As we’ve come to expect from Rose Metal Press, Monster Portraits is a hybrid creature, a collaboration between a sister and a brother, part illustration, part text—the text part inspired by the drawings, rather than the other way around—and part autobiography. Because how can you look at monsters without also looking at the self. 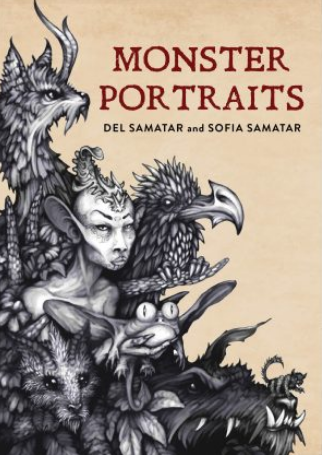 Described by Sofia as a “bridge between speculative fiction and memoir”, Monster Portraits is stunning and otherworldly, and yet somehow offers a very tangible experience for the reader. From The Traveller to the Self-Portrait, the drawings in the book are magical, surreal—the prose brief, and poignant. I even found an old childhood monster of mine in these page, hiding there, waiting for me, it seemed. Much love to the authors (you’ve stirred this passion for monsters back up in me), and to the publisher for the opportunity to read and review this extraordinary collection. Monster Portraits will be available from Rose Metal Press February 22nd, 2018.